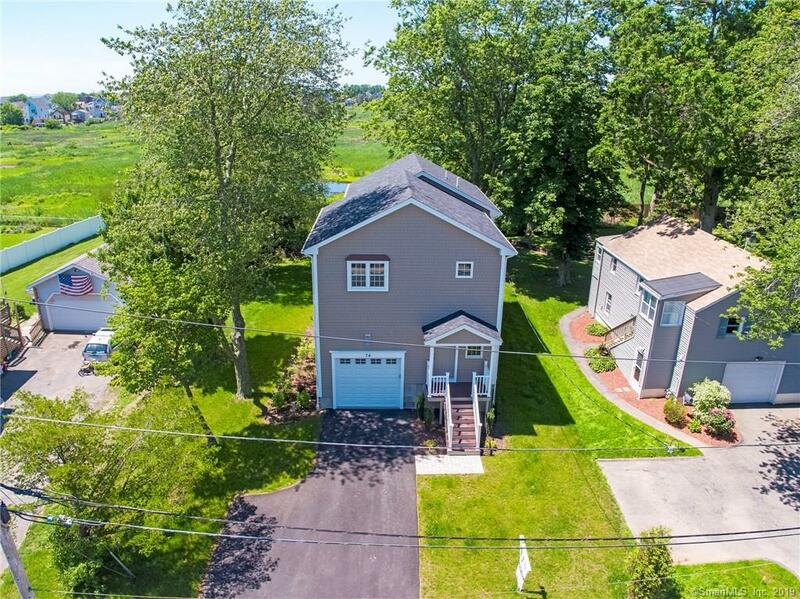 Silver Sands Beach area New Construction colonial walking distance to the beach without the high taxes and expensive flood insurance. This awesome build is flood compliant and is built above the flood elevation. Great views of the salt marsh, short stroll to public access to the beautiful sand of Shell Ave waterfront and Silver Sands Beach. Downtown Milford Green, Milford Train Station, Milford Yacht Club and the Harbor area very close. This location affords you a wonderful and scenic area to walk, bike and run the beach area, and Fort Trumbull sea wall. Home has 3 generous size bedrooms, including a master with vaulted ceilings, walk in closet and elegant bath for two featuring a large tiled shower with dual shower heads and a overhead "rain head". Dual separate vanities. Laundry on upper level. 3.25" oak flooring on 2nd floor including the bedrooms, main level entry foyer tiled, and 3" wood flooring in liv-dining-kit. 1st floor open floor plan, 2 large sliders with views of the salt marsh, out to a 14'x18' rear composite decking with white vinyl rails. Kit has white cabinets, granite tops and island. Lots of extra trim work, crown mouldings, wainscoting and professional carpentry done by the builder himself. Tankless gas hot water, gas warm air heat, gas fireplace and central air. Directions: Robert Treat Dr Turns Into Surf Ave Towards The Beach.